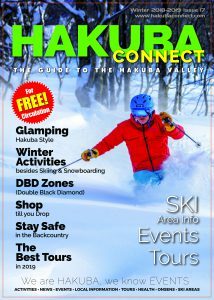 Located about 10km north of central Hakuba but accessible by a number of bus services, Tsugaike rises up the foothills of Shirouma-dake, the mountain from which Hakuba takes its name. Tsugaike has top-to-bottom vertical that rivals Happo One, but more gradual gradients that offer extended runs to a greater range of abilities. Possibly the best word to summarize the resort would be “cruisy”. Orientation is simple with the Eve Gondola climbing the center of the main resort in two stages. First is a short hop over very gentle slopes to a mid-mountain area where you can jump on or off, or more likely stay on to reach the higher upper area. From there you can take a number of routes down to skiers’ right or take a further lift up to the main ridge course. Tsugaike has a further area north of the gondola to lookers’ right, originally a separate ski area. It tends to be very quiet. Almost all of Tsugaike’s terrain is groomed, which may disappoint powder hounds, but means hardly any of the moguls that develop on other resorts’ ungroomed areas between storms. Tsugaike provides smooth respite to those who struggle in the bumps. You can really open it up and let the scenery fly by. 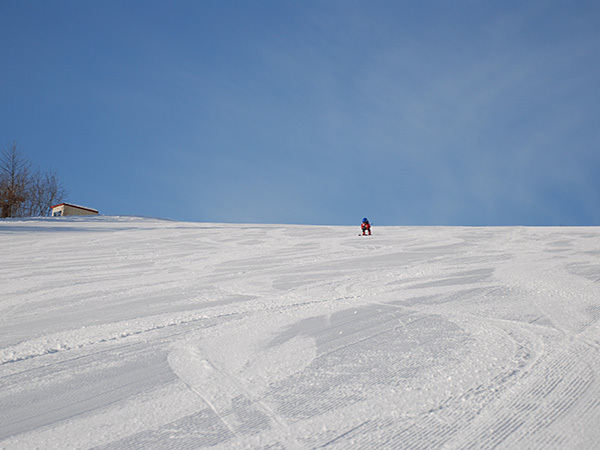 A fine snowpark is built near the resort’s summit late in the season – there’s too much snow to do it earlier! 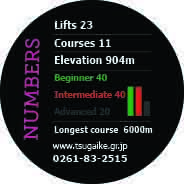 Tsugaike’s biggest draw though is the expansive beginner area at the bottom where ten lifts service Hakuba’s widest piste. When not buried in powder, this area offers a nice easy introduction to sliding on snow.